UPDATE: Since the time of this posting, a few 'good' reviews have trickled in for The Emoji Movie. Which have offset its balance of zero, giving it a slightly better 3% Rotten rating. Which is still pretty low. But not as dire as it first looked. The Emoji Movie reviews are here and pretty much as everybody expected, they're terrible. So terrible that the wannabe Pixar movie has 0% rating on Rotten Tomatoes. Almost all of the reviews use an emoji to describe just how bad it is and most are using the poop face, but some are more kind using the skull and crossbones or the green barf face. Sony's attempt to cash in on the emoji craze is an incredible failure and is being torn apart by moviegoers and critics. Rotten Tomatoes, at the time of this writing, scores The Emoji Movie at a whopping 0%. The Wrap called it a "soul-crushing disaster" while Vulture calls it "one of the darkest, most dismaying films I have ever seen." Some reviews (yes, more than one) explicitly come out and tell potential viewers to avoid at all costs. T.J. Miller's character Meh is what the polite reviewers are calling the movie, just plain meh, which at this stage in the game is a true compliment and should be printed out and put up on Mom's fridge at home. Why is the movie getting torn apart in such savage ways? Is it a case of everybody says it's bad so it must be bad? And the answer is simply: it's that bad. It's dull take on the age-old tale of believing in yourself wrapped up in a crappy box that will bore you to tears. More than one reviewer has also brought up the waste of voice talent in a movie that includes T.J. Miller, James Corden, Anna Faris, Maya Rudolph, Steven Wright, and Jennifer Coolidge. And let's face it, the movie was a horrible idea to begin with, but could have possibly been saved if some effort were put into it, but it just seems like a blatant cash-grab and a slap in the face to the movie going public. The Lego Movie helped open the door for this smartphone adaptation, but Legos have a legacy. Legos have been around for years and are a part of almost everyone's childhood experience and if they weren't, one probably remembers stepping on a Lego with bare feet at the very least. Emojis are relatively new to the collective conscious and this was a disastrous misfire. We can safely blame The Lego Movie for directly influencing and stripping everything that was good about it for The Emoji Movie. 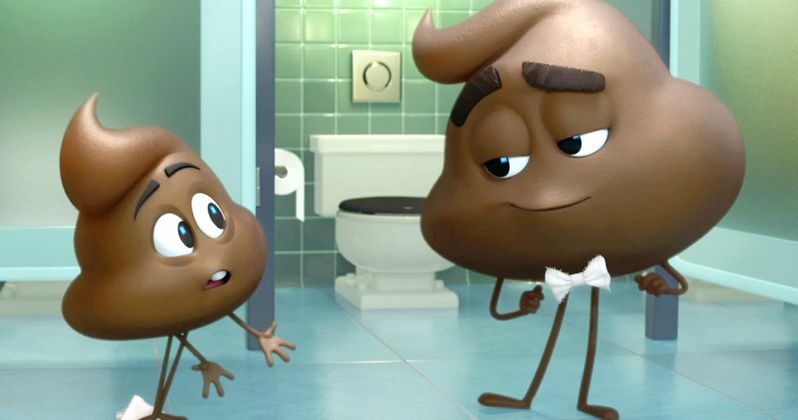 The Emoji Movie is on track to earn around $20 million this weekend after bringing in $900,000 on Thursday evening, which means parents are getting forced to see the movie because of their kids. The gamble might pay off, but still has a ways to go before it can recoup its $50 million dollar budget. You've been warned, we've all been warned to stay away from what one review calls a "flaming dumpster fire of a movie." But, it could go down as a cult classic for being so bad, that it's actually good like Tommy Wiseau's The Room or Mariah Carey's Glitter.